Ever though the good old neighborhood could use more action well this mod adds much more fun and action to Sanctuary hills. It also includes Chapter I & II join the bloods or the crips, more turf wars, quests and much more. Bloods Vs Crips III is coming soon thanks for being patient. This started as simply a way to have sanctuary clean and semi fortified when i started a new game. Then i realized its been 200 years, someone would have settled here already. For now its simply a clean version of sanctuary. Very early WIP. Now Requires all the DLC to Function. - Finish setting up decor and enviroment. - Set up Quest and Story. This is my first mod, i apperciate any constructive criticism, advice or ideas. Sanctuary cleaned up. 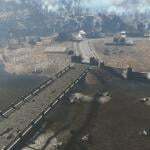 Bridge rebuilt and basic settlement stuffs placed. Codsworth diarys (unfinished and unfinilized) (Spoilers for future Quest). Placed in Player Home. You're Special, and Grognak books returned to playerhome. Cooking Stove added to main settlement house. Grognak magazine now works properly. Resource building added in to compensate for loss of scrapping materials. Chemistry Station also added in resource building. Linked Chemstation and Cooking Stove to Workbench, General Cleanup. Dead Bodies and Platforms can now be Manipulated through the workshop. Fixed every dresser having 250 Ballistic Fiber in its inventory. Fixed BOS platforms not being able to be built upon in workshop mode. This is a Version containing the unfinished Quest Bunker. Its going to be a massive underground complex built with quite a story. Don't explore it if you don't want to ruin the fun. The New Bunker complex is now about 90% complete. Partial Lighting and Navmeshing Started. I will be officially start designing the quest and filling the bunker with general lore friendly information. I will be trying to fill in a lot of what is missing in the lore with my own personal take on what happened to the military after the war. This mod adds a new Loot Collection Beacon item. Dropping it in a cleared location allows you to automatically loot all bodies, containers, plants and loose items. After reaching a total of at least 20 settlers in all controlled settlements, a new NPC appears in the Diamond City marketplace named Brother Bob. Speaking with this NPC will allow you to receive one complementary Loot Collection Beacon for you to try out. Clear a location and drop the Beacon to use it. It is sorted as a Miscellaneous Object. The Beacon is most effective at facilitating looting when it is in the centre of an area. The Beacon will call a Scavenger who will allow you to select a controlled settlement to which the looted items will be delivered. 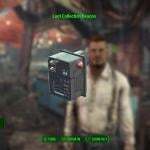 When a Beacon is used but the player leaves an area before selecting a destination settlement or if a destination settlement is not chosen, all looted items will be automatically added to the player. Returning to Brother Bob will allow you to purchase additional Beacons. The looting mechanisms used by this mod to automatically loot whole ares is functionally the same as having your companion, for example, pick up items/harvest plants/loot containers. Because of some oversights by Bethesda, this can actually cause some scripts to not fire as presumably intended. For example, Bobbleheads and Magazines must be picked up by the player directly from the game world to fully elicit their effects. Having your companion pick up a Bobblehead then taking it from their inventory does not fully confer the same intended effect. This is the same case for this mod. You need to drop it on the ground and the pick it up again. Only items of the Vanilla game are fully supported. Items added by the DLCs or other mods will not be looted unless they are stored in bodies or containers. I do not own the DLCs. Do not upload this mod or derivatives to the Nexus. This mod and/or derivative works can be uploaded to all other sites.